As a college professor I get really nervous whenever I watch a Hollywood film about people who do what I do for a living. Academics are usually portrayed in the movies as myopic bookworms or comic buffoons. 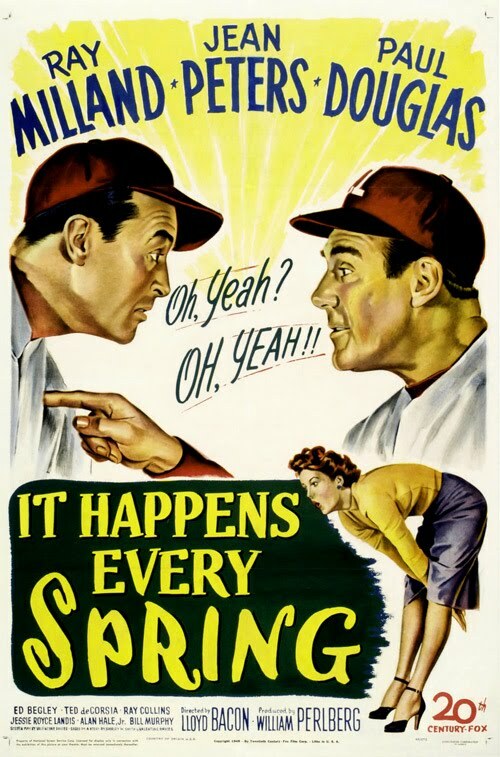 Not the case with 20th Century Fox's It Happens Every Spring, which finds chemistry teacher Ray Milland taking a leave of absence to spend a season on the pitchers’ mound for St. Louis. Milland’s Vernon Simpson becomes screwball hero “King” Kelly after accidentally discovering a chemical solution that makes baseballs impervious to wood. Once Milland cleverly figures a way to get his solution onto game balls he becomes the best pitcher in the majors, and miraculously leads St. Louis to the World Series — all while trying to keep his identity hidden from his academic colleagues and fiance. It Happens Every Spring received a well-deserved Oscar nomination in the Motion Picture Story category, though the film is universally strong. Good dialogue, fine performances, and a story that manages to avoid all the clichés — or at least put a witty spin on them. Jean Peters is fine as the fiancé and Ed Begley is a perfectly-cast team owner — but Paul Douglas positively steals the show as the salty veteran catcher who mentors Milland through the big time. It's easy to see why he would be cast two years later in Angels in the Outfield. The comedy works as well now as it did then and this hasn’t aged a bit. My only qualm is that the film fails to address the fact that Milland’s discovery makes him a cheater. Cheating has a long and extraordinarily well-documented tradition in the American Pastime, but It Happens Every Spring takes the notion of a spitball a bit far. That Milland runs out of formula by the time he’s called to perform in the penultimate game would likely make little difference to the teams who would have been in the series otherwise. Nevertheless this is a warm, yet inexplicably forgotten, entry in the grand tradition of baseball pictures. Starring Ray Milland, Jean Peters, Paul Douglas and Ed Begley. passage of time. We had him as an actor from 1949 to 1959 (he some other film work earlier but 1949 was when he started to get solid acting jobs) as he died from a heart an attack in 09/11/1959. He was like Alan Hale Sr. and William Bendix, you saw him on the screen and there was some about him you liked. take a look at him Angels in the Outfield,Fourteen Hours,Clash by Night,The Solid Gold Cadillac,A Letter to Three Wives and Executive Suite. I got hooked on his work after seeing Clash by Night, a film that we as viewers in future and unknown to these characters and Contemporary audiences would be the waning days of the sardine industry in Monterey, California. After that I went on binge and got everything I could my hands on. So take a chance on Paul Dougals, by doing so we open the gates to the cemetery and let another great actor live again.